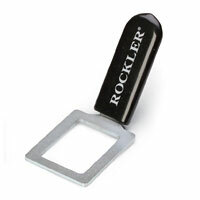 Rockler does a good job of making simple solutions to common problems. One of these common problems comes with using bar clamps. It takes time to release these clamps once you have them completely tightened, and Rockler has a way to speed things up. Sure it only takes a few seconds, but those seconds seem like forever when you are in a hurry to move on to the next project. The EZ-Clutch delivers quick, effortless release of tail stock and eliminates sticky clutch plates on your standard 3700 style bar clamps. Dramatically increases your leverage so bar clamp releases with ease. Hardened steel body for durability. See it in action after the break.